After teasing the car last month, Hyundai has finally pulled the covers off the Tucson N Line, a look-faster trim level for the midsize SUV. While technically an appearance package, it gets a new engine option as well – and it’s another mild hybrid. The 48-volt system, which was introduced on the 185 PS 2.0 litre CRDi diesel with the facelift, has now been fitted to the smaller 136 PS 1.6 litre Smart Stream unit as well, claimed to provide an 11% reduction in fuel consumption. As on the 2.0 litre oil burner, the system consists of a mild hybrid starter generator (MHSG), a low-voltage DC/DC (LDC) converter, an inverter and a 0.44 kWh lithium-ion polymer battery. Also offered are the aforementioned 2.0 litre diesel and a 177 PS 1.6 litre T-GDI turbocharged petrol, and all powertrains meet the latest Euro 6d Temp emissions standards. 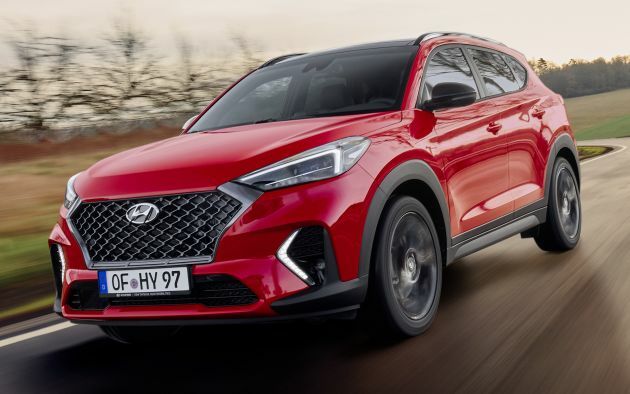 Hyundai has also made some chassis tweaks to the N Line, with the petrol and 2.0 litre diesel mills receiving more linear and direct steering and revised suspension that is eight percent stiffer at the front and five percent at the rear. As far as exterior changes go, there’s a redesigned front bumper with squared-off corners, greater use of body colour and distinctive arrow-shaped LED daytime running lights, along with black bezels for the headlights and a darker mesh grille. You’ll also find gloss black door mirror caps and rear spoiler, body-coloured (instead of chrome) door handles, a sportier rear diffuser and black 19-inch alloy wheels. Inside, there are N-branded leather-and-suede sport seats and red contrast stitching on the steering wheel and seats. Alloy pedals and a leather-wrapped N-branded gearlever with a red stripe complete the look. The post Hyundai Tucson N Line gets new mild hybrid diesel appeared first on Paul Tan's Automotive News. 0 Response to "Hyundai Tucson N Line gets new mild hybrid diesel"